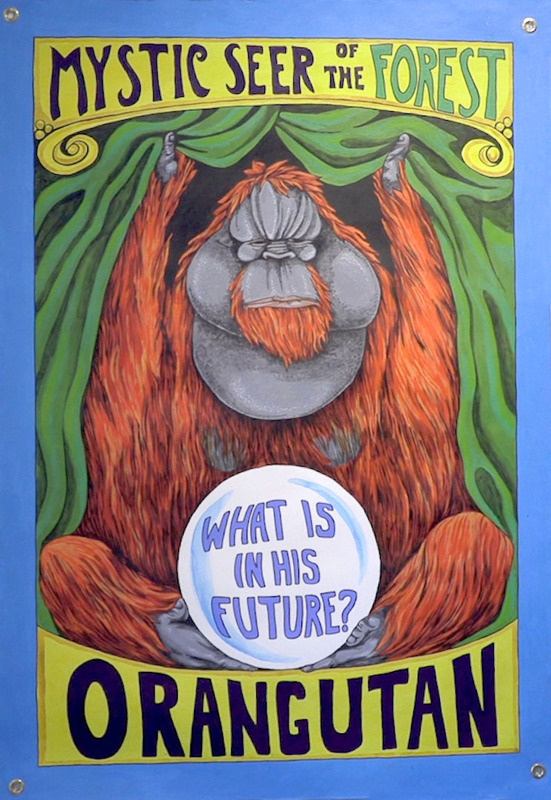 BLOOMINGTON Surrounded by a green curtain, The Mystic Seer of the Forest — a large, bright orange and gray orangutan — is ready to start telling fortunes, but the words “what is in his future?” are written across the crystal ball cradled in his feet. 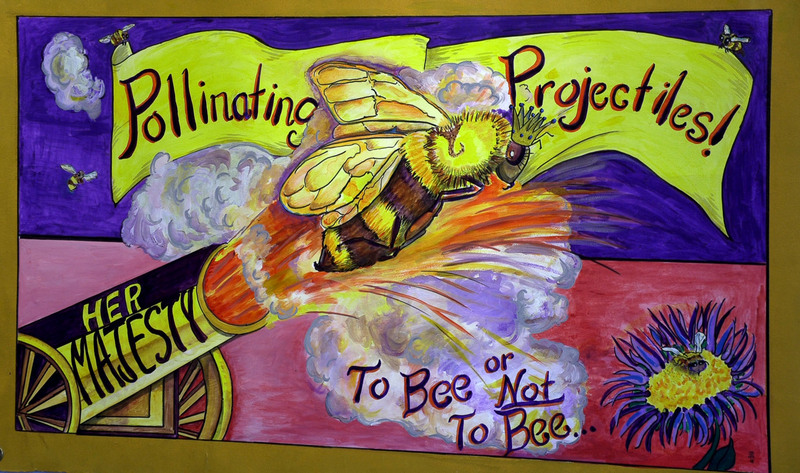 These are just two of the brightly colored side show banners calling the audience to Professor Animalia’s Menagerie of Struggling Species, a collaborative exhibit by husband and wife Bess and Joe Lee. Both have been artists for many years, with Bess a painter and art teacher in the Bloomington school system for 30 years and Joe working as an illustrator for publications across the state. Even though they have been married for 20 years, this was the first project they tackled together. The idea of combining circus banners with endangered species came to Bess after she and Joe visited a folk-art museum and saw old side show banners. “This was a flea circus banner for an actual sideshow,” said Bess Lee. “It had the fleas as if they were little girls or women doing acrobatics on a high wire. 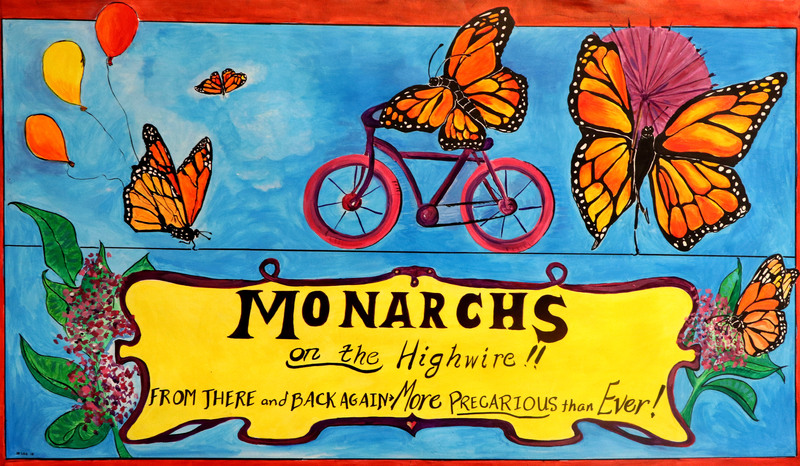 It was just so charming.” She took a photo of the banner and looked at it for the next 12 years until she connected the plight of the endangered monarchs, which spend the winter in Mexico and migrate thousands of miles to the U.S. in the spring, with the flea circus act. The Lees also believed combining circus banners with the plight of endangered animals could bring awareness to the subjects in a way that wasn’t gloomy. Joe’s love of the circus began 30 years ago. He attended clown college at Ringling Brothers and performed in the circus for four years. Bess said living with Joe has heightened her awareness of the beauty of circus art. Each of the 14 banners the Lees have completed so far represents an animal that is endangered and likely to become extinct. “They are driven to extinction for all kinds of different reasons but ultimately, we humans are the cause,” Joe said. He points to the vaquita, which the Lees painted as the Mexican Mermaid. The World Wildlife Foundation lists the tiny porpoise as critically endangered, with fewer than 30 left in the world. They could be extinct as soon as this year. 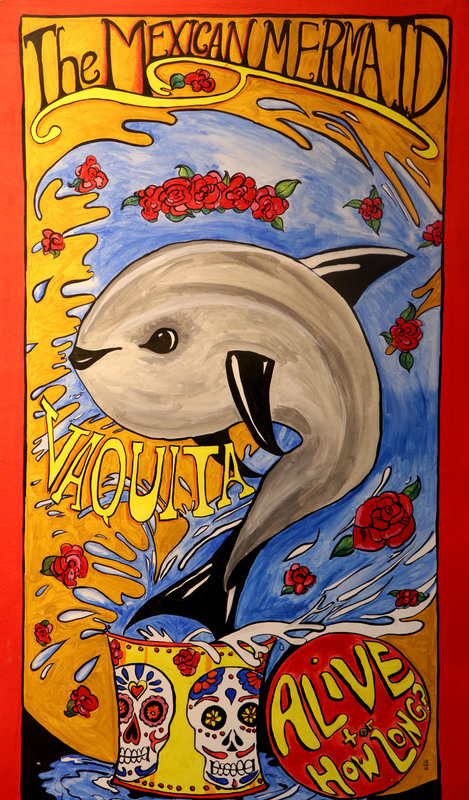 The vaquita’s existence is threatened by gillnet fishing in the waters off Baja California, Mexico. The vaquitas get caught in the nets and drown. “It’s one poignant story after another like that, so we’re very moved and wanted to do something,” Joe said. But, Bess said, many of these stories also included a solution, which led her to think about how to convince people they could make a difference in saving an animal from extinction. The Lees have also pledged 30 percent of the proceeds from this project to Earth Charter Indiana, a statewide non-profit organization working mainly with young people on advocacy and education surrounding climate change. 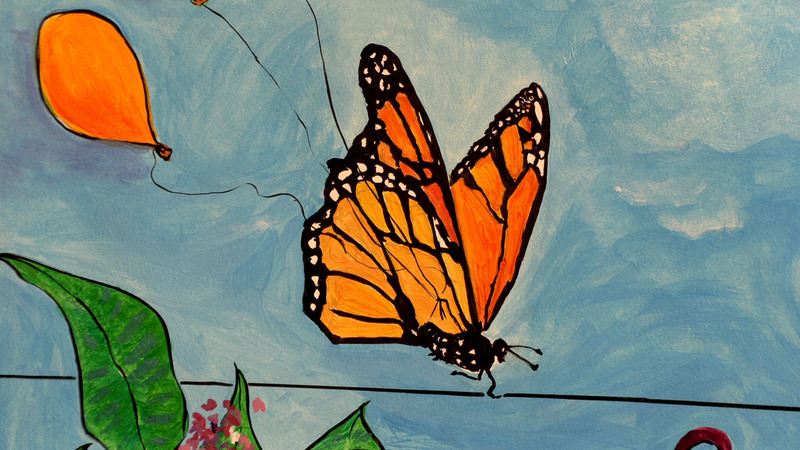 Bess Lee said this partnership with Earth Charter is also a bonus to patrons buying the art. The project has been a labor of love for the Lees. They hope it has some beneficial effects for the future. They plan to continue the project with exhibits, workshops, coloring books, and ways to get involved with each animal. Bess and Joe Lee combined circus banners and endangered species to bring awareness in an entertaining way to the plight of these animals.